Walk up the track past Tilley, the Community Wind Turbine, and climb to the top of the hill. 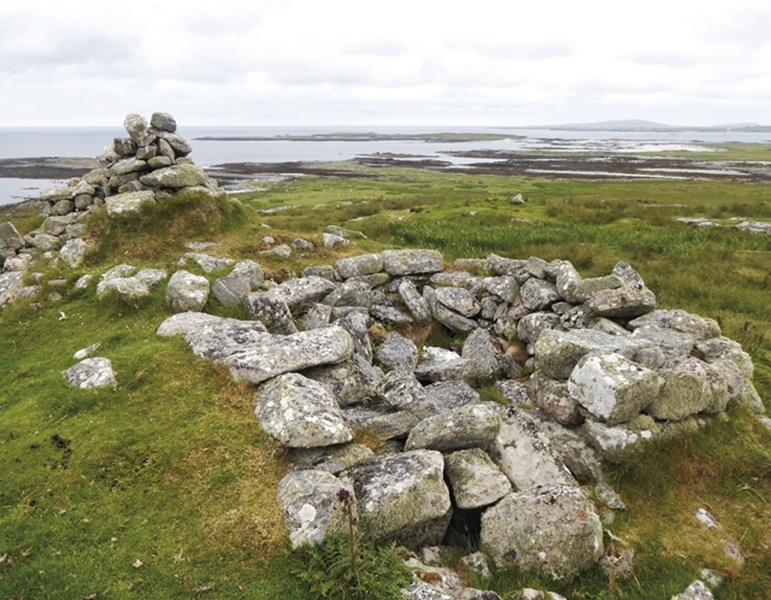 Can you see any signs of the Dùn that once stood in this prominent position? Dùns were Iron Age forts/brochs built around 1400 years ago. The people living here would have been able to spot enemies approaching from a long way across the sea. Can you spot any secret entrances or passage ways? There is an old tale on Tiree about a piper and his dog who entered a cave at the other end of the island, in Kenavara. They followed a secret tunnel to Scarinish where the Piper was heard to shout that he was in need of three hands, two to play his pipes and one for his sword. He then fell silent. The Piper was never seen or heard of again, but his dog appeared out of the end of a tunnel at Dùn Mòr a' Chaolais without a hair left on his body. Some young musicians from Tiree named their ceilidh band Dùn Mòr after this broch.